Friday, June 11, 2010 marks the beginning of a month-long sporting event that is viewed by more people around the globe than any other, including the Olympic Games. What is this event? The World Cup soccer tournament. Held every four years, this spectacle captivates audiences from Asia and Africa, to North and South America, and, of course, Europe. People from all walks of life will be watching on everything from fuzzy-imaged old TV’s to the fanciest LCD/HD big screens, as well as in person at stadiums throughout the host nation which is South Africa. Why would an article about soccer (or “football” as it is known in most of the world) show up on a boxing website? The reason is that the two sports crossed paths over thirty-two years ago in a special way. On October 1, 1977, the great Pele, generally acknowledged as the most outstanding soccer player of all time, was wrapping up his career at Giants Stadium playing his final game with the New York Cosmos of the old North American Soccer League. A true ambassador of the sport, Pele, who had played his entire career for Santos F.C. of Brazil, and for the Brazilian National Team, came to the United States in 1975 to play for the Cosmos and to give the sport a “shot in the arm” in the USA. 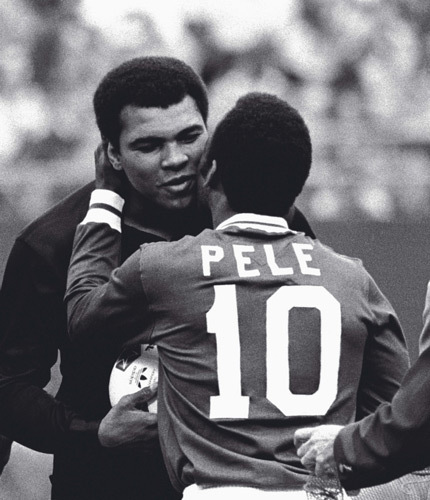 This match was his testimonial game, as the Cosmos faced his former club, Santos, with Pele playing one half for each team.